In the summer of 2000, a miracle occurred: The National Science Foundation decided to fund a new Institute for Quantum Information at Caltech with a 5 million dollar award from their Information Technology Research program. I was to be the founding director of the IQI. Jeff Kimble explained to me why we should propose establishing the IQI. He knew I had used my slice of our shared DARPA grant to bring Alexei Kitaev to Caltech as a visiting professor, which had been wonderful. Recalling how much we had both benefited from Kitaev’s visit, Jeff remarked emphatically that “This stuff’s not free.” He had a point. To have more fun we’d need more money. Jeff took the lead in recruiting a large team of Caltech theorists and experimentalists to join the proposal we submitted, but the NSF was primarily interested in supporting the theory of quantum computation rather than the experimental part of the proposal. That was how I wound up in charge, though I continued to rely on Jeff’s advice and support. This was a new experience for me and I worried a lot about how directing an institute would change my life. But I had one worry above all: space. We envisioned a thriving institute brimming over with talented and enthusiastic young scientists and visitors drawn from the physics, computer science, and engineering communities. But how could we carve out a place on the Caltech campus where they could work and interact? To my surprise and delight, Jeff and I soon discovered that someone else at Caltech shared our excitement over the potential of IQI — Richard Murray, who was then the Chair of Caltech’s Division of Engineering and Applied Science. Richard arranged for the IQI to occupy office space in Steele Laboratory and some space we could configure as we pleased in Jorgensen Laboratory. The hub of the IQI became the lounge in Jorgensen, which we used for our seminar receptions, group meetings, and innumerable informal discussions, until our move to the beautiful Annenberg Center when it opened in 2009. I sketched a rough plan for the Jorgensen layout, including furniture for the lounge. The furniture, I was told, was “NIC”. Though I was too embarrassed to ask, I eventually inferred this meant “Not in Contract” — I would need to go furniture shopping, one of my many burgeoning responsibilities as Director. By this time, Ann Harvey was in place as IQI administrator, a huge relief. But furniture was something I thought I knew about, because I had designed and furnished a common area for the particle theory group a couple of years earlier. As we had done on that previous occasion, my wife Roberta and I went to Krause’s Sofa Factory to order a custom-made couch, love seat, and lounge chair, in a grayish green leather which we thought would blend well with the carpeting. Directing an institute is not as simple as it sounds, though. Before the furniture was delivered, Krause’s declared bankruptcy! We had paid in full, but I had some anxious moments wondering whether there would be a place to sit down in the IQI lounge. In the end, after some delay, our furniture was delivered in time for the grand opening of the new space in September 2001. A happy ending, but not really the end of the story. Before the move to Annenberg in 2009, I ordered furniture to fill our (much smaller) studio space, which became the new IQI common area. The Jorgensen furniture was retired, and everything was new! It was nice … But every once in a while I felt a twinge of sadness. 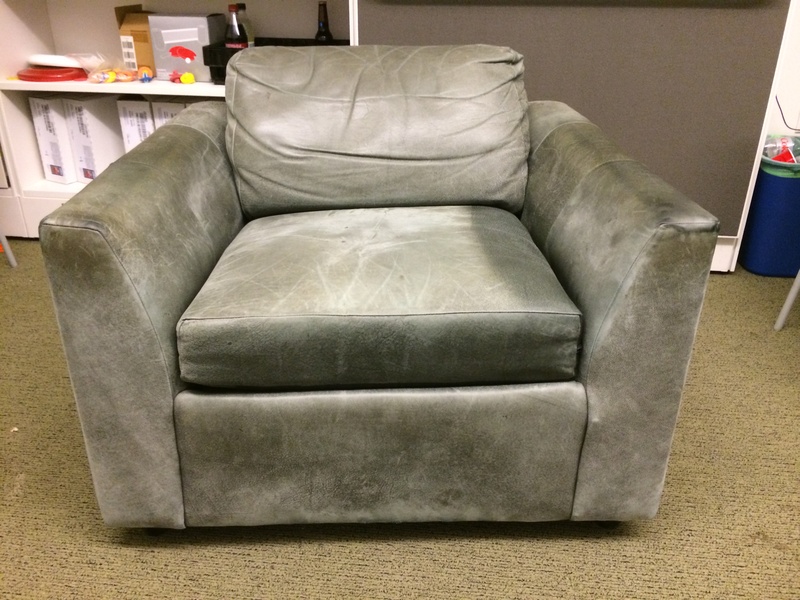 I missed my old leather chair, from which I had pontificated at eight years worth of group meetings. That chair and I had been through a lot together, and I couldn’t help but feel that my chair’s career had been cut short before its time. I don’t recall mentioning these feelings to anyone, but someone must have sensed my regrets. Because one day not long after the move another miracle occurred … my chair was baaack! Sitting in it again felt … good. For five years now I’ve been pontificating from my old chair in our new studio, just like I used to. No one told me how my chair had been returned to me, and I knew better than to ask. My chair today. Like me, a bit worn but still far from retirement. Eventually the truth comes out. At my 60th birthday celebration last year, Stephanie Wehner and Darrick Chang admitted to being the perpetrators, and revealed the whole amazing story in their article on “Macroscopic Quantum Teleportation” in a special issue of Nature Relocations. Their breakthrough article was enhanced by Stephanie’s extraordinary artwork, which you really have to see to believe. So if your curiosity is piqued, please follow this link to find out more. 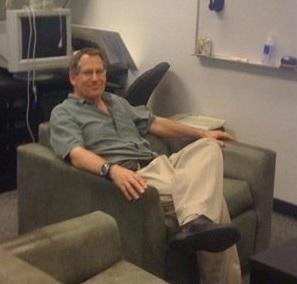 Me and my chair at our original location in 156 Jorgensen (2009 photo). Why, you may wonder, am I reminiscing today about the story of my chair? Well, is an excuse really necessary? But if you must know, it may be because, after two renewals and 14 years of operation, I submitted the IQI Final Report to the NSF this week. Don’t worry — the Report is not really Final, because the IQI has become part of an even grander vision, the IQIM (which has given birth to this blog among other good things). Like my chair, the IQI is not quite what it was, yet it lives on. The nostalgic feelings aroused by filing the Final Report led me to reread the wonderful volume my colleagues put together for my birthday celebration, which recounts not only the unforgettable exploits of Stephanie and Darrick, but many other stories and testimonials that deeply touched me. I’m proud of what the IQI(M) has accomplished, but we’re just getting started. After 14 years, I still have a pulse, and my chair has plenty of wear left. Together we look forward to many more years of pontification. This entry was posted in News, Reflections and tagged Institute for Quantum Information by preskill. Bookmark the permalink. That chair looks like it comes from the Flintstones.